Calella Apartment for Sale – Property for sale in Calella, Costa del Maresme, Barcelona, Spain. Brand new three bedroom duplex apartment offered for sale in Calella on the Costa Maresme. Located next to the church in the centre of Calella, the apartment is well finished with parquet flooring, aluminium closures, gas central heating and quality finishes. The apartment has 3 bedrooms, 2 bathrooms plus attic with access to the roof terrace facing the sea, where you can enjoy the fine weather. The build area is 110 square metres. Feel free to come and see, it certainly is a fantastic opportunity to purchase a property in Calella. The resort of Calella is a well loved tourist destination and is just fifty kilometres from the city of Barcelona, so this would make a great holiday home or rental investment. The price of this duplex apartment in Calella is 216,000 euro. Located overlooking the beach and sea in Les Cases D’Alcanar, on the Costa Dorada, Spain, this terrific two bedroom apartment is currently available for holidays and short breaks in this super location. Fabulous 2 bedroom air-conditioned apartment, sleeps up to 4 people and has sea views from the terrace, it is just a short stroll to the beach and to the village centre of Les Cases D’Alcanar, which is in the extreme south of the Tarragona province of Catalonia, and is in the coastal section of the municipality of Alcanar, a town of some 10,000 inhabitants. Weekly rentals in this fine Spanish property are offered for just 270 euros, while you can spend a weekend by the sea for only 130 euros. The nearest airport for accessing this apartment is at Reus, which is about 65 miles drive, you could also travel from Valencia or Barcelona if you prefer. So for your next holiday on the southern Costa Dorada you should certainly consider this Alcanar apartment. More details here: Alcanar Holiday Apartment. Salou Holiday Rentals Apartment – Fabulous two bedroom apartment offered for holiday rentals in the Costa Dorada coastal resort of Salou in the Catalonia region of Spain. Offering spectacular sea views this holiday apartment is located a short drive from the Port Aventura Theme Park, and Salou centre and offers 2 bedrooms (sleeps up to 6 people), bathroom, fully equipped kitchen, spacious lounge, terraces with sea views, lift access (8th floor). Salou is just 12 minutes drive from Reus International Airport and only 45 minutes drive from Barcelona airport, those wishing to book this apartment would be advised to secure a car hire vehicle to get the most from their holiday in the area. Salou is by far the most popular coastal resort on the Costa Dorada, it boast some fine beaches, a fantastic nightlife scene and a great range of facilities, making it perfect for family holidays. Apart from the Port Aventura amusement park, there are lots of other things to do in the Salou area including some historic places such as Tarragona and Reus, the region enjoys a wonderful climate with salou weather being very pleasant from May to October, winter temperatures can be lower but still very nice for winter breaks and Christmas rentals. 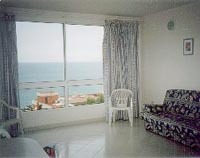 Holiday rentals are offered in this Salou apartment from £400 to £800 pounds sterling per week.